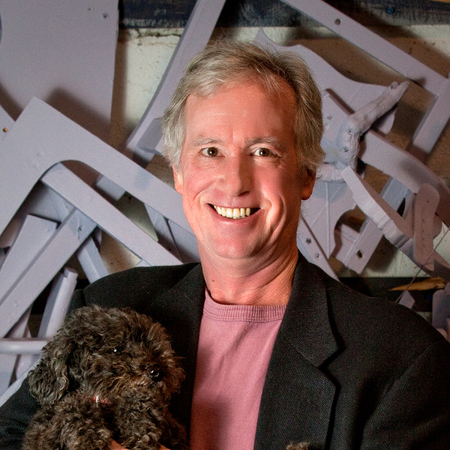 While David Borenstein is known as an architect, he is also a practicing fine artist. In fact, David was a sculptor long before opening his practice as an architect. David holds a BS degree from Bard College where he majored in Fine Arts, focusing on sculpture. He also has an MFA from Bard, earned as a class member of the first masters program. David pursued this degree during the summers off from Massachusetts Institute of Technology, where he studied architecture and earned his Master of Architecture. David has worked in almost every medium, and can make almost anything his medium. From the structural steel in his welded sculpture to the six-pack liners found in his paintings, found objects find their way into much of his work. David is an architect unique in his hands-on approach to building. This also influences the way he approaches his art. Understanding the structural as well as the visual value of an object, he is a master of choosing harmonious parts, and assembling them in an impactful way. David has shown at the Limner Gallery, Cornell Street Gallery, Climate Gallery, Carrie Haddad Gallery, a one man show at the Rhinecliff Hotel, a group showing at the Rhinebeck Town Hall, Ulster Savings Bank, Barrett Art Center, Dutchess County Council on the Arts and the Columbia County Council on the Arts.